Inspired Play for All at the ARCpark! Both Justin and Ashley, who are adopted, have several significant disabilities. Happy and very social, Ashley is deaf and blind. She also has a seizure disorder and an intellectual disability. Justin has various disabilities that include autism. “He had spent three years in an institution before I adopted him,” says Nickerson, who has a total of six children, four with significant disabilities. 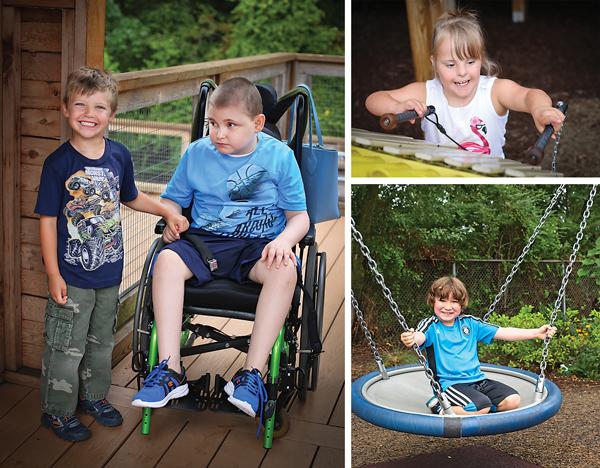 The park is intended for all kids and families, not just children with disabilities. And that’s an aspect Nickerson appreciates. It gives her children a social outlet “they would never have otherwise,” she says. 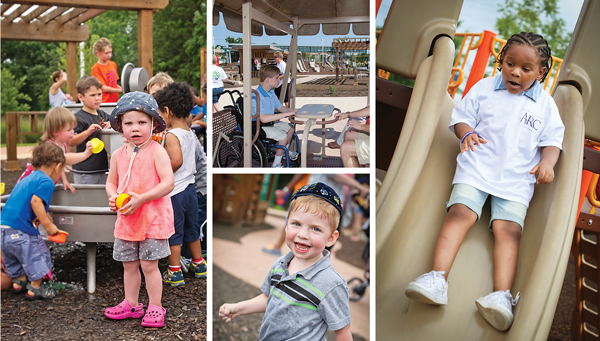 The park is the brainchild of The Greater Richmond ARC, a nonprofit organization that provides services and programs to people with intellectual and other developmental disabilities, helping them live happy, successful, and meaningful lives. Each year, ARC helps more than 1,400 individuals with disabilities. Programs include infant and child development services for children from birth through adolescence who are at risk for developmental delays, have delays in development or a developmental disability, or suffer from an injury that affects their development. ARC’s after-school and day-support services help adults and students with developmental disabilities become more independent, build self-confidence, and engage in therapeutic recreation and social activities. The organization’s employment services help people find jobs in community businesses. Camp Baker provides a traditional camp experience for children ages six through adult, combined with respite for families and caregivers. The camp is a barrier-free, fully accessible facility for individuals with disabilities situated on twenty-two wooded acres near Pocahontas State Park in southern Chesterfield County. Kids of all ages – with and without disabilities – play and learn side-by-side at the ARCpark in Richmond. Families who have younger and older kids in wheelchairs know the park is safe and barrier-free with wide paths and ramps for easy access. On hot August days, the water features are popular, and children and adults with autism appreciate the sensory wall year-round. Tai’Vonne, right, participates in child development services for speech at ARC, and like all the kids who visit the ARCpark, loves the facility. 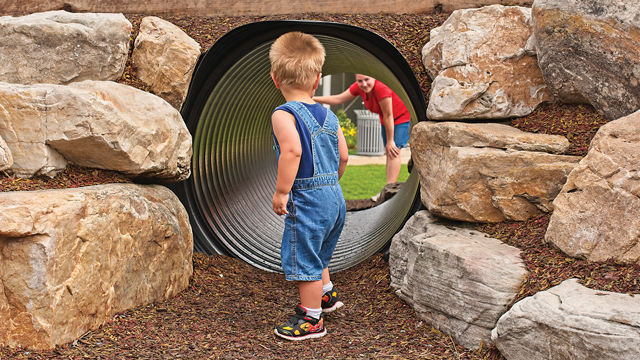 Opened in 2015, the ARCpark was designed based on feedback from ARC’s clients, their families and caregivers, occupational and physical therapists, and special educators. The group also studied research regarding the needs of people with developmental disabilities. When it opened, it was the first handicapped-accessible park in Virginia. “When we were building the park, a mom told us she has two kids with disabilities, both in wheelchairs,” Watson recalls. “She is petite. She told us when you get to the park, you have to take care of the personal needs of your children. She was adamant when she asked for a family restroom that is handicapped-accessible and a changing table for kids and adult children.” The park was designed to meet that parent’s needs – and the needs of many other families – with accessible pathways that are wide enough for two wheelchairs to pass and rubber safety surfaces. It also has charging stations for electric wheelchairs, a tree house with a ramp to the top that is wide enough for walkers, and other adaptive equipment, misting stations, and play and fitness equipment for persons of all ages and abilities, including a glider that can accommodate a wheelchair. Kim Watson of ARC is shown with Ashley (top left), who enjoys her time spent at the ARCpark. Every part of the park was “a significant decision in terms of selection and placement of the component,” says Cara Coffman, director of ARC’s infant and child development services, noting that some components are stimulating, while others are calming, educational, or therapeutic. In the landscape, all of the trees and plants were planted to stimulate the senses. 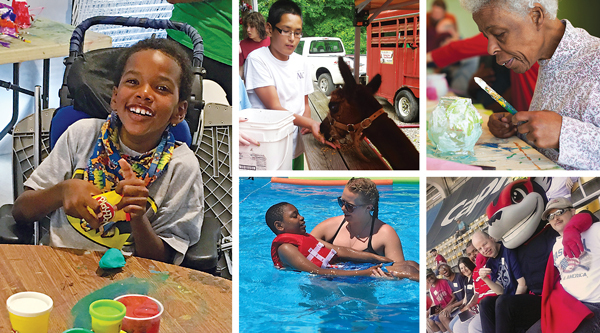 The Greater Richmond ARC offers a variety of services for kids of all ages and adults with disabilities on-site at its Saunders Avenue facility (home of the ARCpark), at various locations throughout Richmond, and at Camp Baker in Chesterfield County. Thousands of Richmonders count on ARC for services ranging from employment, to speech therapy, to after-school and day support. The park has three playgrounds for different ages. A fitness loop in the rear of the park provides stationary cycles for working out arms and legs (arm cycles for those in wheelchairs to build upper body strength). It also has three height levels of chin-up bars, two levels of wheelchair height parallel bars, adaptable exercise equipment, and a half-size basketball court. Visitors will also find a greenhouse for year-round recreational gardening and a center play area with slides, a bridge, and a small tunnel. The pavilion in the park can be rented out to groups. A year after it was built, it had already seen thirty school groups and 125 private parties. Last month, ARC hosted free community events for families, featuring the Richmond Symphony instrument petting zoo, arts and crafts stations from the Cultural Arts Center at Glen Allen, and others. Previous articleBaby, It’s HOT Outside!